Also Gipsy, Whole-Gip, Whole Gyp, Whole-Gyp, Go Around, Go Round, Seesaw, See Saw, Pass Round, All Around the Corner, Hop Around, Go Round About, Partners Circle, Face to Face, Wheel. Thanks to Colin Hume, Susan de Guardiola, Andrew Swaine, Tom Hinds, Jim Saxe, Paul Cooper, John Gardiner-Garden and many others who have provided information, insights and guidance. Any errors below are, of course, entirely mine! The Gypsy is a dance move where two people dance all the way around each other, facing each other the whole time; the default is clockwise, but a Left Shoulder Gypsy can also be specified. Variations where you stop facing each other part way around are very common, most notably the modern version of the square dance move "Walk Around the Corner", but also in contra dance moves like a Gypsy Hey: Partner Right Shoulder Gypsy, Neighbour Left Shoulder Gypsy. I will also look at variations where one person is stationary while the other person dances around them as in a Gypsy. English is a rich and varied language wherein many words have multiple different meanings. This is one of them! In this context the word Gypsy is a historical dance term. It has nothing to do with the people known as gypsies. There is repeated use of a mutually facing orbit that the masters usually refer to as going "in ruota", literally, "in a wheel". Murry (Square Dance): "Every man shall sett unto his woeman once, and then goe round her, and then set unto the woeman that stands on his left hand, once also, and then goe round her also;". This could, of course, be a Back to Back, but the fact that you end facing your Corner suggests that it might be a Gypsy. There is much debate and controversy regarding these dances. My belief is that there were very few gypsies. I will discuss this in detail below. The New Round O: "the 1. cu. hop round one another waving their Hands". A gypsy with style! Whereas many of the other potential gypsies in the Dancing Master are probably Back to Backs, this dance has "Back to Back" as the next move, thus eliminating the confusion. The (Highlander's) Wedding: "The First Man and Second Woman dance round each other to their Places". There is no indication of the styling, or the exact facing, but this could well be an early example of a modern Gypsy. "To gipsy is, after crossing over 1 Cu. to pass your Partner back to back & cast up again turning your Partner with both hands to your own sides". It was featured in the figures for a dance called Clasemont or Miss Caroline Morris. Since the move does not involve the dancers going around each other, facing, this would appear to be a use of the word "gipsy" as the name of a completely different move. Dancing Masters through the ages have chosen words to describe moves as they please, hence the proliferation of meanings for words such as Dosido and Allemande. "The Ladies and Gentlemen pass round each others situation", "They all form complete ovals." While the diagram and words could be describing a Back to Back that is extremely unlikely since Wilson uses the term Allemande when he means Back to Back, and defines it very clearly as such on page 12: "The Lady at A and Gentleman at B move around each other's situation back to back". Wilson also defines Double Ovals on page 123 with #1 Man doing a Gypsy with #3 Man around a stationary #2 Man - Ladies doing the same. However, no-one has yet found a published dance containing either the "pass round" or the "Double Oval"! Wilson published hundreds of dances, but not a single "pass round" appears. "To dance this trait… observing to turn towards the stand of the opposite dancer… finishing… facing the stand from which you came." This move starts as a modern Back to Back, but then the dancers turn to their right and go back to place looking at each other as in a Gypsy. No wonder there is confusion in interpretation of historical moves as to whether they are Back to Backs or Gypsies! "* In performing this figure, the Lady and Gentleman sometimes pass each other face to face; and this has a very good effect, when done with genteel address." As with the previous V.G. reference from 1817, we have a mix of Back to Back and Gypsy, or possibly a full Gypsy, depending on how much of the move was done face to face. Country Bumpkin: "1st woman meets bottom man again, Gypsy, back again, and same with 1st man and bottom woman". Unfortunately the original manuscript is lost. Although the word was probably "Gypsy" we can't be sure that it was not a transcription error; and there is no information about what a "Gypsy" was - as we have seen, the word has been used to mean other moves. Whole-Gip Facing Centre: https://round.soc.srcf.net/dances/cdb/cdb6/figures" the dancers… face each other squarely throughout the movement". See the discussion below for why I think most of his interpretations are unlikely. He did find "The New Round O" - see 1703 above. They used Cecil Sharp's Whole-Gips in two of the dances, but again, the interpretations are unlikely, details below. However, they did find "The (Highlander's) Wedding" - see 1728 above. W.S.Porter, Marjorie Heffer and Arthur Heffer published this book of interpretations of old dances. The Bishop: "third couple gipsy facing inward". The dance is from 1778, but that move isn't in the original; it was added in 1931 to give the third couple something to do. As far as I know, this is the first published usage, with reference to country dancing, of the term "gipsy", that we can be sure means the move that we do today. A year later the same team of Marjorie Heffer and William Porter published this book of 25 new dances that they had composed. The book was not officially sponsored by the E.F.D.S since the focus of the society was on "genuine" historical and traditional dance. Seven of the dances have "gypsies"; the notation always specifies the direction, clockwise or counter-clockwise, and the facing, inward or outward, using Sharp's terminology. Note that the "i" has turned into a "y" since 1931! Two of the dances specify "gypsy, facing outward", but, as Colin says regarding The Queen of Sheba, "I don't think anybody calls it with the "facing outward" any more,"
There is some background information about The Apted Book and Maggot Pie at http://colinhume.com/demaggot.htm. See Appendix 1 for early Walk Around the Corner variants. These were Back to Back variants, NOT Gypsies! I think it is interesting, given that the readers of the magazine would generally be experienced dancers, that Pauline (or the editor) thought it important to define the term "Gypsy". This would tend to imply that the move was not common, even in the 1960s in England. Pat used the Gypsy extensively in his choreography in the 1970s, but not before that. Gypsy: "two dancers, taking and holding eyes, dance a circle or oval around each other". Ah! The first mention of eyes! I haven't checked Zesty Contras, but a draft copy of the sequel, Give-and-Take, from 2002 has 649 dances, of which 100 have some form of gypsy! But see Appendix 1 for details of earlier variations of this move, some of which were very different. Each village had its own traditions for the Morris. A figure that is common across many villages is for the dancers to dance forwards, passing their partner by the right shoulder, then fall straight back, and repeat with the left shoulder. Some sides stop in a line, like "Into Line Siding"; some go further. Some, like Ilmington, Ascot-under-Wychwood and Bledington may involve turning away from your partner as you fall back. This move goes under many different names: "Half-Gip", "Half Hands", "Go & Come", "Into Line", "Shoulders", "Set Straight" and "(Short) Side-by-Side". The move we call a Gypsy is less common and is known as "Whole-Gip", "Partners Circle", "Face-to-Face" and, very rarely, as "Gypsies". Some traditions, Sherborne and Bledington, include a turn away from your partner as you finish the Whole-Gip. Ilmington Half-Hands. The diagram is headed "Half-Hands or Half-Gip". 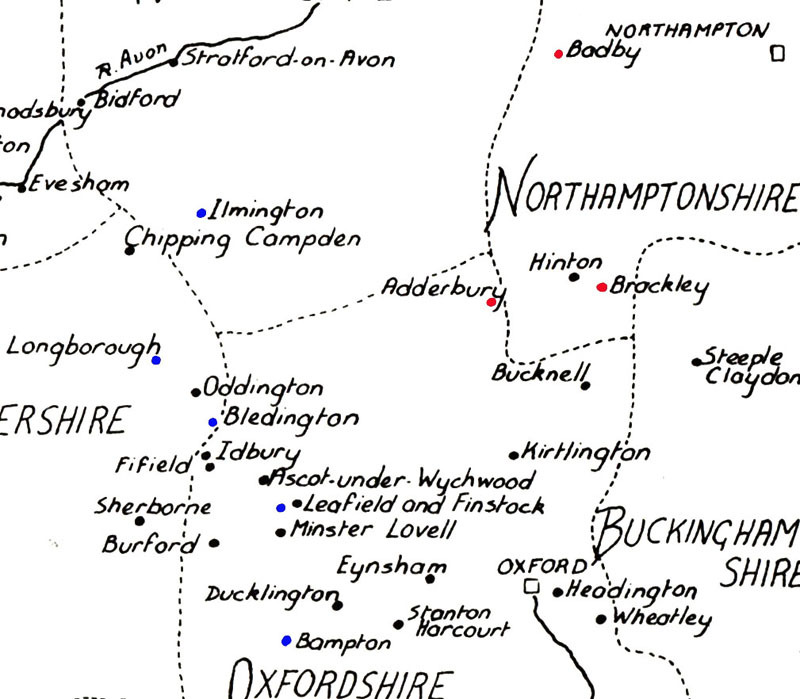 Bampton When he describes the figure he calls it "Whole-Gip or Gypsies", but in the dance notation it is always "Whole-Gip"
This map shows the villages that used the term "Half-Gip" in blue and the ones that didn't in red. The term Gip was not used in the NE of the area. Thanks to Lionel Bacon and The Morris Ring for the map which is from "A Handbook of Morris Dancing". Checking Sharp's Field Notes at https://www.vwml.org/record/CJS2/10/2263 and https://www.vwml.org/record/CJS2/10/2341 the only reference to "gipsies" is by William Wells of Bampton Morris. Of course, we don't know how much the two words, Gip and Gipsy, were used by country dance teachers in the early 20th century. I would guess that Whole-Gip Facing Centre was often shortened! My belief is that Cecil Sharp took the word Gip from Morris Dancing and applied it to country dancing, and eventually Gipsy was used in country dancing, while Gip still prevails in the Morris. Where the word Gip came from we will never know. I just treat it as the name of a move, with no relationship to any other definition of the word. When looking in detail at 17th century documents it is important to understand that the dances were almost certainly submitted by different Dancing Masters, who were not necessarily using the same conventions as each other for the meanings of words. Also, grammar, spelling and punctuation had not been standardised. You only need to look at the page numbering of the first edition to realise that proof-reading was not one of their strengths! So, we need to be careful of drawing conclusions on single pieces of evidence. Although I have had advice from many people, they don't all agree with all my findings. All the opinions stated herein are mine alone. Before we look at Cecil Sharp's interpretations let us analyse "Backs and Faces". "Go back to back" and, eventually, just "back to back" became common in later editions of The Dancing Master, and fairly obviously mean a Back to Back as we know it. However, the first edition contains many "back to back" references which do NOT involve going around each other. These have led to much confusion. The Gipsys: "Leade up, downe agayne, then they all turne theire backes, both men and woemen, towards one another, and then turne themselves as they were before, all their faces together" and "the first man, and the last woeman, doe turne theire right sides together, and then their left sides, and then they sett their backes together, and then theire faces". Several dances have "turn back to back" which might be interpreted as turning while having your back to your partner, but here we have "turne theire backs… towards one another" which clearly does not involve rotating around one another. Lady Lay Neare Mee: "First Cu. meet, turne back to back, go from each other, faces againe"
Petticoat Wag: "Lead up forwards and back, turn back to back, faces againe"
Cuckolds all a row: "Turn back to back with the Co. We. faces again"
The Spanish Jeepsie: "turn all back to back, faces again"
It is clear from many of these that "turn back to back" just means to turn individually on the spot. You can see a modern interpretation of this in the first chorus, 10 seconds in, at https://www.youtube.com/watch?v=tOJagnlnV_U! Indeed, when I just instruct beginners to "turn back to back", without any further clarification, that is what most of them will do (though not necessarily with the bumping of backsides!). If you are turning on the spot, what is the difference then between "turn back to back, faces again" and "Turn Single"? Is it different stepping? Is it an eight-beat move instead of a four-beat move, thus giving the dancers more opportunity to do fancy stepping? Do you turn half way then half way back, or continue your turn in the same direction? My understanding is that there was lots of fancy stepping in the 17th century, so my interpretation is that this was a chance to impress people with your terpsichorean skills, turning one way and then the other. There are examples of this in Feuillet; for example, the diagram for the start of l'Amoreuse shows the first couple turning away with a "sink and spring on both feet" then turning back (part way, as the next move is a cast) with the same stepping. Moll Peatlye: "Arme or halfe turne"
The Milking Payle: "Halfe Turne"
It is possible that the "Halfe Turne" was "turn back to back, faces again". My conclusion from this is that "turn back to back" is a simple, solo turn on the spot. This is another confusing phrase. Do you keep facing in your original direction, not turning in relation to the room, or do you keep facing your partner? Saint Martins: "fall back to your first places, We. doing the like, not turne your faces"
From these two dances I would conclude that "not turning your faces" is in relation to the room, not to your partner. I teach many beginners how to Dosido; the most common fault is to turn after you have passed your partner. I believe my "Don't turn!" is the equivalent of "not turning your faces". There are four dances that contain "go about… not turning your faces": The Spanish Jeepsie, Lord of Carnarvans Jegg, Cuckolds all a row and Saturday night and Sunday morn. Sharp didn't publish the first, and specified Whole-Gips for the rest. I believe that "go about… not turning your faces" means "Back to Back" in all these dances. Cecil Sharp, in the Country Dance Book Part II, 1911, defined a "Whole-Gip Facing Centre" and a "Whole-Gip Facing Outward". Original words: "Men turn off to the left hand, and fall behind your We. back to back, turn back again to your places". Sharp's words: "Men turn outward, each to his left, and stand back to back behind their respective partners (r.s.). First man and first woman, standing back-to-back, turn around, counter-clockwise, to places (sl.s)." So, perhaps Sharp could have used his "Whole-Gip Facing Outward" here, although the entry and exit are different. However, based on the analysis above of "Backs and Faces" it is unlikely that the original version involved the couple rotating around each other. Original words (Cuckolds all a row - Sharp changed the name! ): "Turn back to back to the Co. We. faces again, goe about the Co. We. not turning your faces." Sharp's words: "First man and second woman whole-gip facing outward, clockwise… First man and second woman whole-gip facing centre, counter-clockwise." From the research above, I would interpret this as Half Turns on the spot followed by a Back to Back. Original words: "Each man and Wo. goe about each other, not turning you faces. That again." Sharp's words: "Each couple whole-gip, facing outward. That again, counter-clockwise." Strange that Sharp interprets the same words as in "Cuckolds all a row" to mean facing outward rather than facing centre. But either way, from the research above I would interpret this as a Back to Back. Original words: "Men take your we. by both hands and put all back to back, then change places all with your own we. then we. give right hands across and go half way round while the men go on the outside the contrary way." Sharp's words: "Each man takes his partner by both hands and pushes her backward into the middle. Partners change places. Partners change places. The women right-hands-across half-way round; while the men dance half-way round, counter-clockwise, outside them." The two "Partners change places" could perhaps be interpreted as a Gypsy, but note that there is only one in the original. The second one is implied by the fact that the women head back in for the star while the men move out, but the men would be turning to their left, away from their partners, to head counter-clockwise. A nice, flowing, modern interpretation could be a Left Shoulder Gypsy which would get everyone moving in the right direction. I suspect that it wasn't how they did it in 1665. Original words: "First Man and 2. Wo. goe about into each others places . First Wo. and 2. man as much : First man and 2. Wo. change places, the other as much . ". Sharp's words: "First man and second woman Whole-gip, once-and-a-half round, facing centre, falling into each other's places…". The first line of the original could easily be interpreted as a Change Places, but the musical punctuation shows that it takes eight beats, rather than the normal four beats, as used in the third line for an actual Change Places. So, was it a slow Change Places, looking at each other and doing fancy stepping? Or was it Back to Back 1 & 1/2 times as "goe about" so often probably means? Or is Sharp's idea, that it was a Whole-Gip 1 & 1/2, the correct one? If there were more examples of dances with definite Whole-Gips then I would be more readily accept a Whole-Gip 1 & 1/2. But it could be. This has the same diagrams defining the two Whole-Gips, but no use of a Whole-Gip in any dance. Original words: "go about your owne, not turning your faces". Sharp's words: "First man and first woman whole-gip facing centre clockwise…". From the research above I would interpret this as a Back to Back. Original words: "the 1. cu. hop round one another waving their Hands". Sharp's words: "First man and first woman the whole-gyp, clockwise, facing and waving their hands (hopping step; four hops on right foot, four on left)." The last but one dance in the last book, and we finally get what is probably an actual Gypsy (albeit highly stylised)! Personally, I think it would be more comfortable just to do a step-hop around (single step, hornpipe step, skip step). Original words: "First man goe about the 2. Wo while his Wo. doth the like to the 2. man, they meet, and goe about one another and turne, taking hands, the same againe till they come to the bottome." My interpretation for the first movement would be a Half Figure Eight Down. The "goe about" sequence is probably a Back to Back plus Half a Two Hand Turn to get Proper so that they can continue the sequence. However, it does not include the phrase "not turning your faces", so it is possible that it could be a Two Hand Turn 1 & 1/2, or a Gypsy plus Half a Two Hand Turn. Douglas and Helen Kennedy continued Sharp's work in their 1929 "The Country Dance Book - New Series". There are three dances which either have Gypies or which they interpret as Whole-Gips. Original words: "The First Man and Second Woman dance round each other to their Places"
The Kennedys' words: "First man and second woman dance twice round each other clockwise"
This, to me, seems the perfect move to interpret as a Gypsy. But they don't. Strange! Original words: "...fall back and back to back sideways, the 1. and 2. Men change places side-ways, the 1. and 2. We. do the same at the same time"
The Kennedys "... fall back a double. Partners whole-gip, facing outward, clockwise "
"Back to back sideways" doesn't sound to me like Sharp's "Whole-Gip Facing Outward", but if you limit yourself to documented moves then that may be the closest fit. My interpretation would be that move could well be the modern move known as Mad Robin or Sliding Doors, which we often teach as being a sideways back to back. Original words: "The 1. and 2. cu turn back to back and clap Hands, then face about and clap again"
The Kennedys "All clap hands on the first beat of the first bar, and partners whole-gip clockwise. All clap hands on the first beat of the fifth bar, and partners whole-gip counter-clockwise." See "Backs & Faces" above. These are almost certainly just turns on the spot. The Boone Companion: "each man shall sett to his woeman, and fall backe, and then goe round his woeman, then the woemen shall sett, and doe the like;". Cuckles all a row: "each man shall goe round about his owne woeman" and "after that he hath gone round about his owne woman, first, and then about the woman, that is opposite against him, and then hee shall goe round the woeman that was opposite to him first, and his own last;". The Gipsys: "then every man goeth round his woman, then backe agayne, not turning of her, but only goeing round her". If the man was not facing the woman then there would be no need to say "nor turning of her", so here is an early example of a Gypsy-like move in a dance called The Gipsys! I think sometimes the universe likes to have a good laugh at us! Bonny Dundee (1703): "The 1. Man go round about the 1. wo. into his own place". My favourite is Figure Seven http://contrafusion.co.uk/Dances/EFDS6709-MoreFigureEightsFromHerefordshire.html#seven where you have to dance around #2 Man as many times as you can! Ladies Cross Over by the Left Shoulder, Men Cross Over by the Right Shoulder, twice, all in eight beats. In this move, which occurs in many historical and modern dances, the two ladies are effectively doing a Gypsy with each other while the two men do the same. Larry Jennings includes a definition for it in Zesty Contras as a "Double Gyp". It has also been referred to as a "Double Gypsy". Sharp did an amazing job, given the resources that he had available to him, and his interpretations stand as great dances in their own right, regardless of how close they may or may not be to the originals. It is clear from the Lovelace Manuscript that the dances at the time already had many variations, so why not have some more? The Gypsy did exist in early Playford, if only in one dance, Round O, but was extremely rare. Sharp's "Whole-Gip Facing Outward" probably never existed. Strangely though, a 1949 variant of the Square Dance move "All around your Left Hand Lady" has the men doing a move like "Whole-Gip Facing Outward" around their ladies! Although the concept has been known since the beginning, the Gypsy was rarely used in dances until the 1970s, but has become extremely popular since then. The earlier Hart and Harmer uses of the word "gypsy" are fascinating, and may well have been part of an oral tradition with links to the Morris "gipsies", but our use of the word today is almost certainly based on Sharp's use of the word, and it is extremely unlikely that he was familiar with Hart or Harmer. We will never know where Gip came from, and whether it had any relationship to gypsies. But many words have multiple meanings and my belief is that Gip was an independent Morris term which ended up in country dancing as Gipsy through the folk process. Given that many Gips involve turning your back on your partner, that the first mention of eyes being involved is 1983 in America, that the term came from Morris Dancing, and that Morris Dancers do not "gaze" at each other, then we can safely assume that it is not related to the Welsh word "gyp" meaning "gaze"! "popular Texas filler: All around your left hand lady, (Passing right shoulders do a do-sa-do around your corner) See saw your pretty little taw (passing left shoulder, the men go around their partners and back to place)"
Owens's description of the See-Saw/Sashay part similarly says, "The gentlemen keep their backs to the ladies throughout …"
The only record of this styling is in Owens' book. (General): Ladies take three steps into the center of the square and make a slight curtsey. While they are doing this, the men pass right shoulders (on the outside of the square) with their corners. Ladies back out of the center as soon as their corners are on the left side. Men now walk back toward their partners, going in front of their corner. (Modified) The ladies do not go straight into the center. They go to the center while drifting towards the man who is going "all around." As partners are not facing during this it is not considered a do-sa-do. (Dallas and Australia Variation) Just in reverse of the above with the men moving in front of their corner and then behind to return to partner. (count: 8 steps) Figure is usually followed by See Saw Your Pretty Little Taw. (Basic): The ladies move directly into the center of the square, curtsey and back out while the men continue the figure eight they started (with All Around Your Left and Lady) and pass left shoulders (on the outside again) with their partners and pass back to place in front as the ladies move out. (Count: 8 steps). (Modified): The ladies do not go straight into the center. They go to the center while drifting towards the man who is either going "all around" or "see sawing." While doing my research I also studied Back-Circles. There is the question of whether, when four people turn back to back, they automatically do a Back-Circle. Playford: Shepheards Holyday: "men and We. backes before and meet, hands backward and goe round as before"
Playford: The Health: "turne back to back, hands backward round to your places"
Lansdowne: Hunsdon House: "meet turne in back to back hand the back inwards and goe halfe round"
Playford: Mage on a Cree: "turn back to back, come to you places"
Playford: Fine Companion: "turn back to back"
Playford: Faine I Would: "turn back to back"
However, as we have seen above, "turn back to back" probably did not involved rotation. Also, since other dances do specify the rotation and these don't then these were probably not Back-Circles. Then there is Kettle Drum! Playford: Kettle Drum: "then turn back to back, and kisse the Co. Wo twice"
Is "Co." your Corner, as in Mage on the Cree, in which case you don't need to rotate, or your Opposite, as in Newcastle, Dull Sir John and Hunsdon House, in which case you need to do half a Back-Circle? Feedback is very welcome on any aspect of this article or these Web pages.